Vehicular Assault: Fight or Flight? You’re in pursuit. And you’re irritated. It’s near the end of your shift, and you were on the way in to the barn, when you spotted a white Jeep blow through a stop sign. You’re pretty tired, but it went down right in front of you, and that just won’t do. So you decided to pull one more stop on this busy night. Of course, the genius behind the wheel of the Jeep decided that he wasn’t going to cooperate, and the chase was on. Up ahead you can see that the unit from the next sector has deployed spike strips, so you know that, although the pursuit might not necessarily be ending, at least it’s going to slow down…and that’s good, since traffic is a little heavy for this nonsense. You and the officers from the other sector car approach the Jeep on foot, weapons in the low ready position. When you order the driver out, he gives you the finger and keeps rocking the Jeep in the mud. Just as you’re about to reach for the door handle, the Jeep breaks free and lurches forward, directly at the guys from the sector car. They try to jump out of the way, but the grass is wet and one goes down. Not knowing what else to do, you fire three quick rounds at the driver as he passes. The Jeep swerves away from the downed officer, and hits a tree. The driver slumps over, dead. While this scenario isn’t played out every day, similar incidents have occurred in the recent past. Many of these situations have caught the attention of the national media, and therefore the public. While most incidents end appropriately, others seem to involve elements that give rise to significant public, and therefore administrative, concern. In response to these incidents, many agencies are tightening up their deadly force policies in haste. Numerous departments are creating new and restrictive procedures for the use of deadly force against occupants of motor vehicles. There is no known national data regarding the frequency with which officers shoot at moving vehicles. From what informal data that we have, and depending upon the jurisdiction, such shootings may account for as many as 8% of police deadly force incidents. It’s also difficult to locate data regarding the number of officers struck by vehicles. We do know that 143 officers died after being struck by vehicles during the ten year period from 1995 to 2004. While this figure represents only 8.7% of the overall officers killed figure, 18% of law enforcement officers “accidentally” killed during the same period died from injuries they suffered after being struck by a vehicle. And, while most of these undoubtedly were accidental, at least some are likely to have been intentional, or as the result of carelessness or recklessness on the part of suspects. In fact, every year there are a number of high profile incidents involving officers shooting at vehicles that they report were trying to run them down, usually during a pursuit or an escape attempt. Incidentally, it’s worth noting that the kinetic energy of an oncoming vehicle isn’t always what kills police officers. Getting pinned between an oncoming car and a fixed object, or simply being crushed, dragged or run over by a moving vehicle can also prove fatal. There is a common assumption that officers can simply step out of the path of an oncoming automobile. While that might sometimes be true, determining the validity of that assumption requires a case-by-case examination of all relevant facts. Some items to be considered would include the distance between the officer and the oncoming vehicle, the officer’s exact location in relation to the vehicle, the velocity of the oncoming vehicle, the vehicle’s acceleration potential and closing rate, and factor’s influencing the officer’s ability to exit the “fatal funnel” projected by the vehicle, such as slippery footing. We should also ask whether the officer was injured, fatigued or disoriented from preceding events to the extent that his or her abilities to react effectively were diminished. Published 0-60 mph acceleration rates are largely irrelevant in many shooting scenarios. However, vehicle acceleration rates over a 20 foot distance – from a standing start – are relevant, as that is generally the distance within which many officers are standing when attacked by drivers of moving vehicles. In reviewing published data, it appears that virtually any vehicle on the road is capable of accelerating fast enough to cover 20 feet in two seconds. Setting the speed/lethality issue aside for a moment, the implications relative to officer reaction time are obvious. Typically, what we see in many of these scenarios, by virtue of distance and vehicle speed, is that there are about 2 seconds or less to react once the vehicle has initiated movement toward the officer. This “two second” rule of thumb impacts everything from the officer’s ability to move out of harm’s way to whether his or her later shots are likely to strike the suspect’s vehicle at a “questionable” angle. Another commonly held, erroneous perception of incidents in which officers fire at moving vehicles is the so-called “revenge shot.” This phenomenon generally is an outgrowth of a rapidly evolving deadly encounter in which officers tend to fire multiple rounds in rapid succession. Occasionally, one or more of the final rounds impacts the side or rear of the moving vehicle. And, they are sometimes the rounds that inflict death or serious injury to the driver of the vehicle. District Attorneys, the media and the public tend to view such events with skepticism. Since there hasn’t been much research into this phenomenon, the presumption of innocence tends to deteriorate into the belief that the officer’s final shots were punitive in nature. This perception seems to have metastasized to the point where many police administrators have also been influenced by it. While much has been written about officer reaction times in deadly force encounters, not as much has been done regarding the issue of deadly force against moving vehicles. Bill Lewinski’s Tempe Study offers insights that literally scream for attention in this regard. Previous literature has suggested that stop-reaction time – the time it takes for someone actively engaged in an action to react to a new stimulus – is approximately one second. Bringing sophisticated technology to bear, Dr. Lewinski’s research suggests that a multi-tasking officer might require as much as 7/10 of a second to process a “stop stimulus” when firing during a simple multi-task sequence. Is running away from the path of an oncoming car an example of multi-tasking? Most would agree that it would be a strenuous, chaotic and stressful one at that. How will reaction times influence the final shots fired? Let’s combine some facts already established and a few speculative and/or hypothetical concepts with the firing potential of most semi-automatic pistols. The Tempe Study determined that a Glock (G17) with a 10 lb. trigger facilitated shots being fired at intervals of about 0.25 seconds. That has confirmed our own anecdotal observations with a shooting timer, that an officer can fairly typically fire 4 shots per second from a 9mm Glock 17. Combine what we know with a few observed characteristics of incidents involving officers shooting at moving vehicles. If an officer finds himself 20 feet in front of an oncoming vehicle that is merely closing at a rate of 10 mph (14.6 fps) that vehicle will reach the point where he was standing in about 1.37 seconds. If the vehicle is closing at 20mph, it’s moving at 29.2 fps and will reach the officer’s original position in 0.68 seconds. If the officer is faced with the prospect of reacting to the impending threat with his/her handgun holstered, it will typically take 1.78 to 2.00 seconds to draw and fire one round. If the officer has been trained to fire strings of shots in rapid succession as long as a threat is perceived as being persistent, it’s easy to envision how and why everything after the first shot fired might result in non-frontal strikes to the oncoming vehicle. Even if the officer initiated firing with his/her gun drawn, the reaction time to the first sighted shot fired (.54 seconds) would likely lead to the third or fourth shot fired resulting in non-frontal hits to the vehicle, depending upon its closing speed. There are two United States Supreme Court cases that set forth the basic standards for use of force while making a seizure of a free person: Tennessee v. Garner, 471 U.S. 1 (1985), and Graham v. Connor, 490 U.S. 386 (1989). The first of these establishes the standard for the use of deadly force, while the second provides direction for assessing the reasonableness of all uses of force by an officer, up to and including deadly force. Both Garner and Graham are Fourth Amendment cases, in that they set standards for the use of force in making a detention, arrest, or other seizure of a free person which the U.S. Supreme Court has stated is properly analyzed under the Fourth Amendment. The standard is one of “objective reasonableness.” Put plainly, objective reasonableness means that which another officer is likely to have done under similar circumstances, without regard to underlying prejudice, bias or motivation. It goes without saying that deadly force is also appropriate to prevent the “infliction or threatened infliction of serious physical harm” mentioned by the Court. That’s called self defense, and as long as an officer reasonably believes that his or her safety or the safety of another person is at serious risk, deadly force is probably justified. · Whether the subject is resisting arrest or attempting to evade arrest by flight. While the Graham Court did not prioritize these factors, subsequent federal case law has strongly indicated that the most important factor is whether or not the officer or others are faced with the imminent threat of harm, then whether the suspect is actively resisting arrest, followed closely by the degree to which the situation is tense, uncertain and rapidly evolving. It’s worth noting that “imminent” does not necessarily mean “immediate”. A threat can be imminent, as in “about to happen”, while not being immediate, as in “about to happen in the next instant”. An officer’s analysis of whether or not a threat is “sufficiently imminent” should be based on his or her reasonable perception of the totality of the circumstances surrounding the need for the use of force. An example might be a suicide bomber that an officer can see is wired with explosives. Depending on the bomber’s reaction when challenged, an officer might reasonably use deadly force if he or she reasonably believes that the bomber’s actions constitute threatened infliction of serious physical harm. “The "reasonableness" of a particular use of force must be judged from the perspective of a reasonable officer on the scene, rather than with the 20/20 vision of hindsight.…..The calculus of reasonableness must embody allowance for the fact that police officers are often forced to make split-second judgments - in circumstances that are tense, uncertain, and rapidly evolving - about the amount of force that is necessary in a particular situation. So what are we left with? Use of force in making a seizure, including deadly force, must be objectively reasonable under the Fourth Amendment. Whether or not an officer acted reasonably in using force will be measured against the degree of imminence of the threat he or she faced, and how tense, uncertain and rapidly evolving the circumstances were. Based upon the totality of the circumstances as perceived by the officer while making a split-second judgment regarding how much force to use (or, indeed, whether to use any force at all), he or she is justified in using whatever force is reasonable, up to and including deadly force, to prevent the infliction of serious physical harm or death upon themselves or other persons. When feasible to do so, a warning must be given prior to the use of deadly force. Note that nothing previously stated limits the physical circumstances in which an officer can use force, or the level of force that can be used. That limitation is contingent upon the officer’s reasonable perception of danger based on the totality of the circumstances in which they find themselves. Whether officers are dealing with an individual on foot, on a bicycle, riding a motorcycle, or riding in a vehicle, the standard remains the same. Finally, there is a growing body of case law regarding the issues surrounding the use of force against persons in a motor vehicle. While many of these cases view specific issues narrowly, taken together they indicate a clear trend of judicial concern with current law enforcement use of force practices. Trainers, administrators and officers would do well to consult with departmental legal advisors and risk managers regarding policy development and training programs in this area. Naturally, the training implications outlined in this article are almost all tactical in nature. Many are obvious and some are not. Officers routinely attempt to gauge subject behavioral cues to project probable risk levels in a given scenario. However, when dealing with a person or persons within an automobile, some threat cues are masked by the metal and tinted glass of the car. Common assumptions made can have lethal ramifications. Someone might seem compliant, through overt gestures, but are they? In felony stops, the keys that you commanded to be taken out of the ignition and tossed from the car – how could you know for sure that another set of keys weren’t used, or that a spare ignition key isn’t immediately available? If dealing with someone who is visibly agitated and/or exhibiting irrational behavior, one should obviously expect the unexpected. However, there may be issues not readily identified that may elicit a dangerous response from someone who seems calm and rational. Is the subject on probation or parole? Are there outstanding warrants for his/her arrest? Are there illegal weapons or narcotics in the vehicle? There could be any number of sight-unseen reasons why a person might resort to using his/her vehicle in a threatening manner, which is why vigilance and precautionary measures are warranted. Officers can’t always position themselves where they might achieve maximum tactical advantage. There may be environmental constraints that dictate, to some degree, what they can and cannot do. As much as possible, officers should avoid placing themselves in proximity to the front or rear of a vehicle with an engine that is running. When in close proximity (ten feet or less) to a vehicle, even a ten degree offset from that vehicle makes it significantly less likely that the vehicle could be accelerated and turned abruptly enough to strike an officer directly. Such an angle of offset might even tend to discourage a vehicular attack. If an officer is parallel with or behind a vehicle that begins moving away unexpectedly, shooting the driver/vehicle shouldn’t be necessary unless the officer believes someone else is in the immediate path of that vehicle. Whenever possible, an officer should attempt to place substantial physical barriers between him/her self and a vehicle of suspected risk. Trees of substantive size, utility poles, concrete structures and other vehicles are often readily available to serve this purpose. They might also serve double-duty as cover from felonious assault with a firearm that could emanate from the suspect vehicle. Under no circumstances should officers intentionally place themselves directly in front of or behind a vehicle with a noncompliant or irrational – or condition unknown – person at the helm. Unfortunately, this does happen, sometimes resulting in the officer using the elevated risk that he/she created as justification for the use of deadly force when the vehicle lurches toward them. In cases where an officer reasonably believes there is no recourse but to shoot at a moving vehicle, debate often centers on whether an officer should fire with intent to disable the vehicle or the driver. There shouldn’t be any debate on this matter, since it is far more realistic to neutralize the driver than it is to neutralize the car. Yes, the car might be an “unguided missile,” as many contend, if the driver is killed. However, if the vehicle is just beginning to accelerate, it shouldn’t proceed too far after the driver is disabled. Vehicles are often driven for miles after they’ve had their tires or radiators damaged. If there was justification enough to pull the trigger, there is justification enough to shoot the driver. Because of the potential for harm to come to the driver of a motor vehicle, any use of force directed at the vehicle is subject to the same standard as force directed at a person. However, there are some special issues to be considered when setting policy for the use of deadly force against a person or persons riding in a motor vehicle. First, it’s important to remember that we are talking about deadly force, not just use of firearms. As previously discussed, the objective reasonableness standard applies to the use of force in making an arrest, regardless of the instrumentality. In choosing to utilize deadly force to stop a threat being presented by the occupants of a vehicle, officers might very well consider the use of firearms. However, they might also consider intentional contact with another motor vehicle – not always presumed to rise to the level of deadly force, based upon case law in the federal circuits – or perhaps some other unforeseen means by which to deliver the level of force they deem appropriate and reasonable under the totality of the circumstances. Use of firearms to stop a moving vehicle is generally not recommended, for a host of reasons. Not the least of these is that it’s difficult to hit a moving target under the circumstances we are considering, those being an emergency situation where officers have little time to react, and are likely to be moving fast themselves in an effort to avoid being hit by the vehicle. Additionally, most hits to the vehicle itself are unlikely to stop the vehicle’s motion, especially hits with handgun rounds. Even a hit to a tire would only cause the vehicle to be more difficult to control, and to possibly slow down as the tire goes flat. It is possible, however, to imagine scenarios wherein a driver engaged in a vehicular attack upon an officer sees an officer either preparing to fire, or actually firing at his vehicle, and because of his fear of being shot, steers his vehicle away from the officer. In these situations the act of shooting at the vehicle didn’t stop its progress, but caused the driver to veer away on a different path, thus reducing the danger to the officer. Of course, whether or not deadly force in these circumstances is justified is based on the totality of the circumstances facing the officer. On the other hand, a hit to the driver of the vehicle may, in fact, incapacitate or kill him or her, but that offers no assurance that the vehicle will stop or even deviate from its path, especially in the short term. And, of course, if the driver is incapacitated, the vehicle becomes a “pilotless” craft. If the vehicle is traveling at a high rate of speed, this presents a significant hazard to the public. However, in the situations that we are considering, where typically a driver begins from a stopped position, and attempts to drive toward an officer that is within one or two car lengths, the vehicle’s speed is likely to be slow enough to mitigate this risk. Finally there is the question of responsibility for the officer’s shots. When an officer reacts to a threat coming from a moving vehicle by shooting at the vehicle or driver, his or her attention is likely to be focused upon the vehicle itself. It’s possible that an officer might not be as aware of the background of their target as they normally would be. This scenario might give rise to an officer missing the vehicle and striking whatever is behind it, including other officers or civilians that may be in the area. These things having been said, it’s clear that the hazards presented by shooting at a moving vehicle may be significant, while the likelihood of success is questionable. However, if an officer is relatively close to the vehicle, and has enough time to react, then the risks are reduced. And, if the officer or another person is under immediate threat of serious injury due to the actions of the driver, then shooting at the vehicle may be warranted. In a situation where an officer is suddenly and unexpectedly attacked by a subject operating a motor vehicle, an officer who decides to use force must adhere to the same objective reasonableness standard that would be applied were the individual outside of his or her vehicle, and commencing a non-motorized attack. If, in the officer’s judgment, the criteria set forth in Tennessee v. Garner and Graham v. Connor are met, then the officer should use whatever level of force he or she deems to be reasonable to protect themselves or other persons in the area. · While a moving motor vehicle is one option with which a suspect may attack an officer, it’s also possible that the officer will be attacked with other weapons. When shots are fired from a moving vehicle, the risk of serious injury to officers and civilians rises dramatically, and greater consideration may be given to the use of firearms in response. 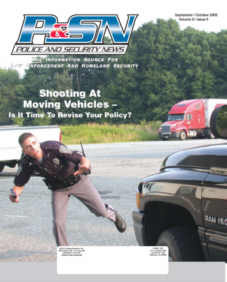 The practice of shooting at moving vehicle has long been controversial in law enforcement, but due to some recent high profile cases, increased scrutiny by the public and the media are driving a re-examination of operational procedures by many agencies. Much consideration is being given to outlawing the practice altogether, regardless of the necessity. This, in effect, creates a higher standard than the law requires. Deadly force is deadly force, and while secondary considerations such as outlined here may be important, the true issue is whether or not an officer’s use of deadly force against a person in a moving motor vehicle is objectively reasonable, as required by law. As with any use of force, officers may be well advised to attempt to find less drastic alternatives, if only for the fact that society generally prefers a peaceful resolution to conflict. However, when officers determine that force is necessary, after reasonable consideration of the totality of the circumstances, they should be allowed to utilize whatever means they believe are necessary to protect themselves and others from the actions of an aggressive individual, whether the attacker is in a vehicle or not.